#Briefton's I've been trying hard to eat healthier and make sure I have enough fruit and veggies in my diet. The Briefton's 5-Blade Spiralizer makes it easier. 5 different blades make the possibilities endless for what you can do with fruits and veggies. I love the angel hair blade. You can make veggie "pasta" for a low carb meal. This spiralizer is made to last. The forward handle is made of stainless steel instead of plastic like the cheaper models. It has strong suction cups that hold it in place too. It's dishwasher safe and so easy to clean, plus it disassembles easily to save on storage space. 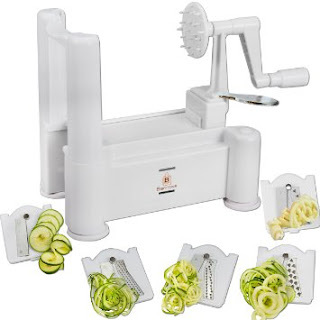 This is the ideal tool for making spiral slices from apples, onions, carrots, zucchini, cabbage, cucumbers, beets, turnips, rutabagas, potatoes, sweet potatoes and many more. Works even on large veggies ( up to 10 inches long by 7 inches wide ) without having to cut them. This spiralizer will save you so much time and effort in the kitchen and make a healthy diet so easy and delicious.